Stanely Castle was originally an early 15th century stone rectangular keep or tower house, founded by the Maxwells of Newark. 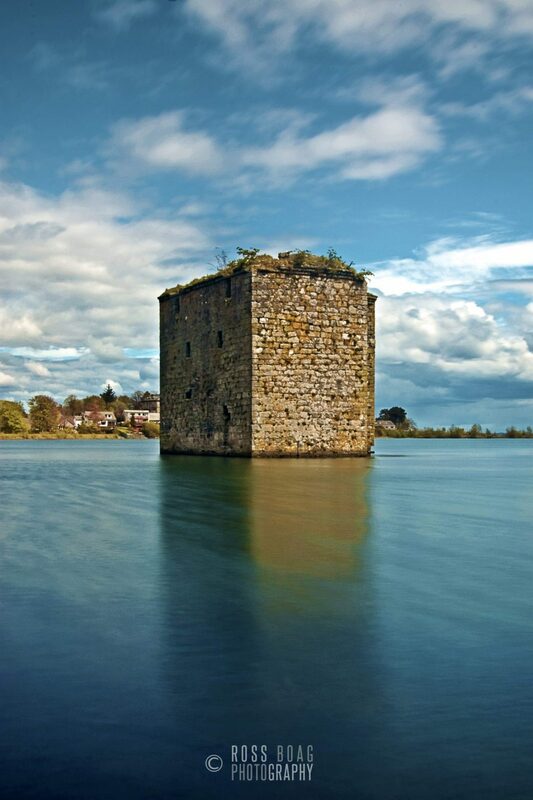 Of four storeys and a garret, it once stood on a narrow promontory or an island within a marsh. In the 16th century, it became a L-plan tower house, when a square staircase wing was added and the ground floor entrance in the re-entrant angle, was guarded from above by a machicolated platform. In the main block there was a basement, with keyhole gunloops, a first-floor great hall and two more chambers above but by the mid 17th century, the tower was no longer used as a residence and was abandoned. From 1837 it has been partially submerged by Stanely Reservoir and is completely inaccessible. The massive walls with there barely adequate windows, still stand to the height of the parapet and corner bartizans but the interior is now an empty shell.